You are invited to the next “showing” of Constellation Chor’s work on December 14th from 5 -6 pm at the Alchemical Theatre on 14th and 6th. I love journeying into new territory, trying to get in touch with and honor the images I see and aural landscape I hear and then transforming that into something visible. Constellation Chor is my space for that. It’s also a space to work with people whose spirits I am moved by and whose artist-selves I feel deeply, and where we co-create together in the moment based on principles I work with aesthetically and musically. For now, calling this “Experiments in Form”. Email crowdedoutletnyc@gmail.com to reserve your donation-based spot. At the end of last year, we decided to further develop four of the projects that came through our SURGE series and GENERATOR 2017 was born. 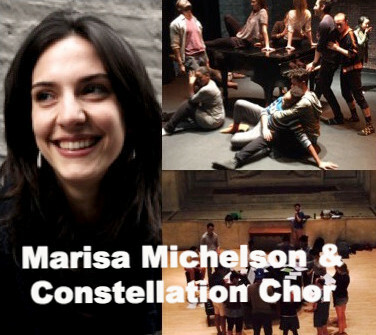 Marisa Michelson & Constellation Chor share a piece they have been developing over the course of the year. Click to reserve your seat.